Burmese literature has a long tradition and goes back well over a thousand years. The oldest extant specimen is a stone inscription dated 1113 A.D., but it is believed that many older inscriptions have been lost or were destroyed during wars. Many of these inscriptions contain eloquent prayers and poems composed by royal ladies. Imaginative literature was written down on palm leaf manuscripts with a stylus, or in folded paper manuscripts in steatite pencil, often under the auspices of Buddhist monarchs. Historical ballads, verse romances, odes, metrical versions of Buddhist Jatakas, and poetic letters constitute this literature. These books flourished until printing became prevalent in the 19th century. The introduction of printing into southern Burma in the early 19th century led to a change in Burmese literature. From 1875 onward, under British rule, the owners of printing presses began to publish popular works such as plays, complete with songs and stage directions. At the beginning of the 20th century, the first Burmese novels were published. The emergence of literary magazines in the 1910s stimulated the popularity of short stories and serialized novels. Nationalist and anticolonial themes were common in literature from the 1920s to the 1940s. Following Burmese independence in 1948, many writers tried to use literature to help create an egalitarian, democratic society. However, following the 1962 military coup, the Myanmar government pressured writers to adapt the themes and style of Socialist Realism, and freedom of expression continued to erode through the turn of the 21st century. In 2013, the first Irrawaddy Literary Festival was being held in Burma. It has ignited international press and public interest and support. The Irrawaddy Literary Festival this year announces the participation of a wide range of highly esteemed Burmese and international authors, journalists and broadcasters, as well as literary agents and publishers. The festival homepage provides more details of participating authors as well as a programme and media coverage. A full text digital copy of the first printed Tipitaka, known as the Chulachomklao of Siam Pāḷi Tipiṭaka 1893 Edition (39 Volumes), printed in Bangkok by King Chulalongkorn (Chulachomklao) of Siam, is available online. The Tipiṭaka is the repository of the Buddha’s words well preserved in the Pāḷi language. Since Pāḷi is a unique historic language and is not known to have its own alphabet, this historic edition provides the entire Pāḷi text in Thai script, totaling over 12,000 pages. sets to royal monasteries all over the Kingdom, and then after a request, presented them as a Gift of Dhamma from Siam to over 250 leading institutions worldwide. A record at the National Archives of Thailand has been found that over 30 countries in five continents have received these royal gifts and many of them are still holding them in good condition. The preservation of this edition began in 2000. A complete digitised draft edition was first published in 2008. The Thai-language introduction was published in 2009 and the English Version was published in 2010 which was entitled ‘ The Chulachomklao of Siam Pāḷi Tipiṭaka 1893 : A Digital Preservation Edition 2010′. A general guide to the Tipitaka in English is available from Buddhanet. A new year – a new beginning. An easy (re)solution, one might think. But it may turn out later that things like love and relationships should not be taken too lightly, and it is always worth thinking twice. Or, at least, seeking advice. People in 19th century Siam would certainly have done so before getting serious in a relationship. They would have consulted a divination specialist (mor duu) who would have had the knowledge to interpret the texts and illustrations of divination manuals (phrommachaat) that had been handed down from generation to generation. Such manuals were part of the paraphernalia of divination masters who specialised in fortune telling, matching the horoscopes of prospective couples, and giving advice on love and marriage. 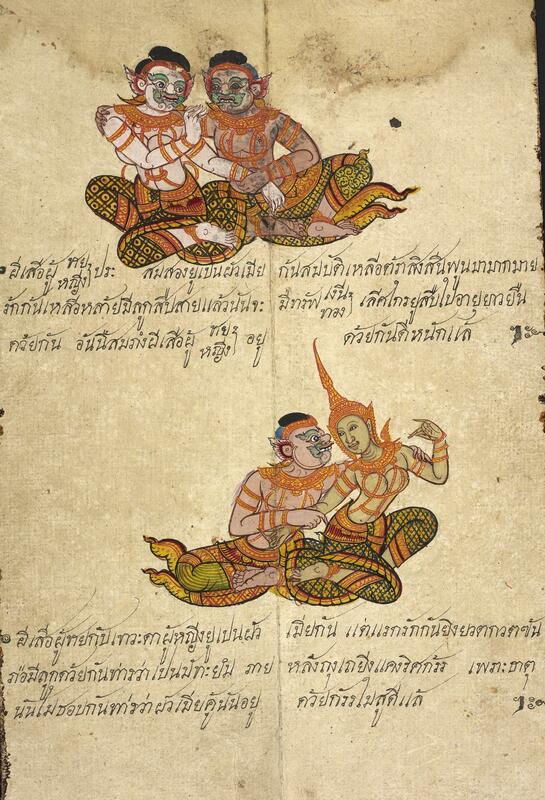 Find out more about one stunning 19th-century Thai divination manual held at the British Library from their Asian Manuscripts Homepage and enjoy amazing images from this fully digitised manuscript.